Three retired teachers who have been awarded contracts under Government’s volunteer scheme to teach in Tuvalu and Nauru are eager to contribute. Air-tickets were presented to retired teachers, Timoci Bosenakadavu, 59, who will be teaching in Nauru, Sailosi Kacanavesikula, 57, and Fulori Halofaki, 56, who will be teaching in Tuvalu. 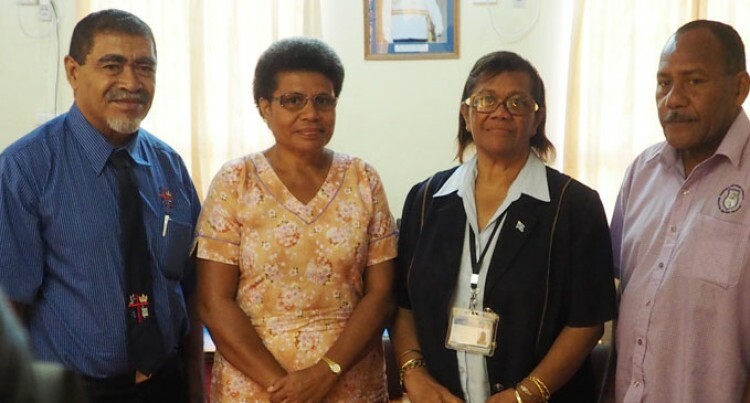 Nauru High Commissioner to Fiji Jarden Kephas and Lorraine Taulima, first secretary of the Tuvalu High Commission presented the air tickets to the three at the Public Service Commission office in Suva. Ms Halofaki, who had previously taught in Tuvalu from 2007 to 2010, said she looked forward to going back. “I’m very grateful that Government accepted my application. After retiring last year from Adi Cakobau School I felt that I’m still fit to continue teaching,” she said. Mr Kacanavesikula said: “I look forward to the new community, the new environment, the people, and my students. I know there will be challenges but I’m used to facing challenges from my teaching days because I was mostly assigned to schools that faced challenges from water problems, etc,” he said. Mr Bosenakadavu who retired from teaching in 2012 said: “I just want to go out there and help develop and nurture the students . With the experience I have I believe I will be able to assist young Tuvaluan teachers that I will be working with,” he said. Permanent Secretary to the Public Service Commission Parmesh Chand said including the three retirees there are now 11 Fijian volunteer teachers in Tuvalu and six in Nauru.